Stephanie Cardon (Sculpture/Installation/New Genres Fellow ’19), Cynthia Gunadi (Fiction/Creative Nonfiction Finalist ’16), Wendy Jehlen (Choreography Fellow ’12), and Steve Locke (Photography Finalist ’17) are among the nominees for 2018 Hubweek Art Awards. Maya Erdelyi (Film & Video Fellow ’17) curated and has work in The Skin Has Eyes: Animated Visions at the Boston Center for the Arts Mills Gallery (2/23-4/28, opening reception 2/23, 6-9 PM). The exhibition also features work by Amanda Bonaiuto (Film & Video Finalist ’15) and Jacob Fried (Film & Video Fellow ’15), among other artists. Solo and collaborative work by Deb Todd Wheeler (Sculpture/Installation/New Genres Fellow ’03) and the late Robert Todd (Film & Video Finalist ’15) will exhibit along with work by Joseph Fontinha in NEXT at Fountain Street Gallery in Boston (2/27-3/31, opening reception 3/1, 6-8 PM). Elizabeth Alexander (Sculpture/Installation/New Genres Fellow ’11) has a site-specific installation (with sound by Todd Bowser) called The Great Enemy of Truth at the Turchin Center for Visual Art in Boone, NC (thru 6/1). She also has work in the group show Art on Paper at Weatherspoon Art Museum in Greensboro, NY (2/3-5/5). Steven Bogart (Dramatic Writing Fellow ’15) will have a staged reading of his play Made in Heaven (produced by The Hub Theatre Co. of Boston) at First Church of Boston (2/25, 7 PM). The play will have another rehearsed reading at the Actors Studio of Newburyport (2/23, 10 AM). His play The Behavior of Wings will be part of the Lake Effect Fringe Festival in Grand Rapids, MI (2/27). As a visual artist, he was recently part of a national juried exhibition at Fountain Street Gallery in Boston. Christopher Castellani (Fiction/Creative Nonfiction Fellow ’16) is publishing a new novel, Leading Men, with a book launch event at Porter Square Books in Cambridge (2/12, 7 PM). Other upcoming events include Odyssey Bookshop in South Hadley (2/13, 7 PM). The book has already received acclaim in The New York Times and Kirkus Reviews. Patrick Donnelly (Poetry Fellow ’08) will read with Anders Carlson-Wee as part of the Blacksmith House Poetry Series in Cambridge (2/25, 8 PM). Nicole Duennebier (Painting Fellow ’16) has a collaborative exhibition with her sister Caitlin Duennebier called Love Superior, a Death Supreme, at Simmons University Trustman Gallery (2/7-3/18; reception 2/14, 5-7 PM; artist talk 2/19, 6-7 PM). Xujun Eberlein‘s (Fiction/Creative Nonfiction Fellow ’08) personal essay How to Die Old in Chongqing was published by Columbia Journal. Ken Field (Music Composition Finalist ’17) was selected by the Somerville Arts Council as its February Artist of the Month. Georgie Friedman (Sculpture/Installation/New Genres ’13) has a solo installation, Georgie Friedman: Vortex at Georgetown University Lucille M. and Richard F.X. Spagnuolo Art Gallery (thru 6/2; artist talk and reception 2/26, 5-7 PM). Basia Goszczynska (Film & Video Fellow ’13) is exhibiting in the group show Dogs are Playful at Neospace in Melbourne, Australia (2/9-2/17). Marky Kauffmann (Photography Fellow ’17) has work in the group exhibitions she at the A Smith Gallery in Johnson City, TX (2/22-4/7) and the Rhode Island Center for Photographic Arts’ Sixth Open Call Exhibition (2/21-3/15). Melinda Lopez‘s (Dramatic Writing Fellow ’19, ’03) solo show Mala is being released on Audible. The play premiered at ArtsEmerson in 2016 and has been performed at the Huntington Theatre Company (Boston) and the Guthrie Theatre (Minneapolis). Brendan Mathews (Fiction/Creative Nonfiction Fellow ’12) has published a new short story collection, This Is Not a Love Song. Upcoming events include readings at the Stockbridge Library (2/23, 4 PM) and The Book House in Albany, NY (3/16, 3 PM). Adam Mazo‘s (Film & Video Finalist ’17) film Dawnland, co-directed with Ben Pender-Cudlip, has numerous screenings this month, including Cambridge (2/8), Jamaica Plain (2/9), Boston (2/13), and Beverly (2/27). Joshua Meyer (Painting Fellow ’10) is exhibiting work at Lyons Wier Gallery in New York, in Courting Incoherence (2/26-3/30; reception 3/2, 6-8 PM). Caleb Neelon‘s (Sculpture/Installation/New Genres ’07) Ed Emberly-inspired wall mural at Cambridge Public Library was featured in Greg Cook’s arts journal Wonderland. Mary O’Malley (Drawing & Printmaking Fellow ’06) is one of the three artists exhibiting in Winter Garden at 13Forest Gallery in Arlington (thru 3/8, opening reception 1/19, 4-6 PM). January Gill O’Neil (Poetry Finalist ’18) recently had her poem Kettling featured on U.S. Poet Laureate Tracy K. Smith’s podcast, The Slowdown. The poet will read at Middlesex Community College (Federal Building – Assembly Room) in Lowell (2/25, 12:30 PM). Kathryn Ramey (Film & Video Fellow ’15) and her film-in-progress El Signo Vacío (The Empty Sign) received a 2019 Creative Capital Award. Monica Raymond‘s (Dramatic Writing Fellow ’13) play The Owl Girl will have its New York City premiere at THML Theatre Company (2/28-3/16). Evelyn Rydz (Drawing & Printmaking Fellow ’10) is among the artists in the traveling exhibit Plastic Entanglements: Ecology, Aesthetics, Materials, on view at Smith College of Museum of Art (2/8-7/28). Natalie Shapero (Poetry Finalist ’18) will read from her poetry collection Hard Child for an event with Craig Morgan Teicher at Belmont Books 2/26, 7 PM. Leslie Sills (Crafts Fellow ’95) has work in the nationally juried show small and MIGHTY at The Clay Studio of Missoula, MT (2/1-2/22). Peter Snoad‘s (Dramatic Writing Fellow ’09) new full-length play The Growing Stone will premiere at Outvisible Theatre in Detroit in September/October. The dark family drama, set in Vermont, received a staged reading at Outvisible last April as part of the Detroit New Works Festival. Dariel Suarez (Fiction/Creative Nonfiction Finalist ’18) recently published a short story collection, A Kind of Solitude. He has upcoming reading events at Books & Books in Coral Gables, FL (2/8, 6:30 PM) and Brookline Booksmith (2/21, 7 PM). Suara Welitoff (Film & Video Finalist ’05) has a solo exhibition, Suara Welitoff: Right Now This Moment, at the Tufts University Grossman Gallery (thru 4/7). August Ventimiglia (Drawing & Printmaking Fellow ’12) joins Ryan Steadman for the exhibition Book at Drive-by Projects in Watertown (2/9-3/30; reception 2/9, 4-9 PM). Cary Wolinsky (Sculpture/Installation/New Genres Fellow ’09) has a solo exhibition of photography, Fiber of Life, at Multicultural Arts Center in Cambridge (thru 3/1; reception 2/4, 6-8 PM). 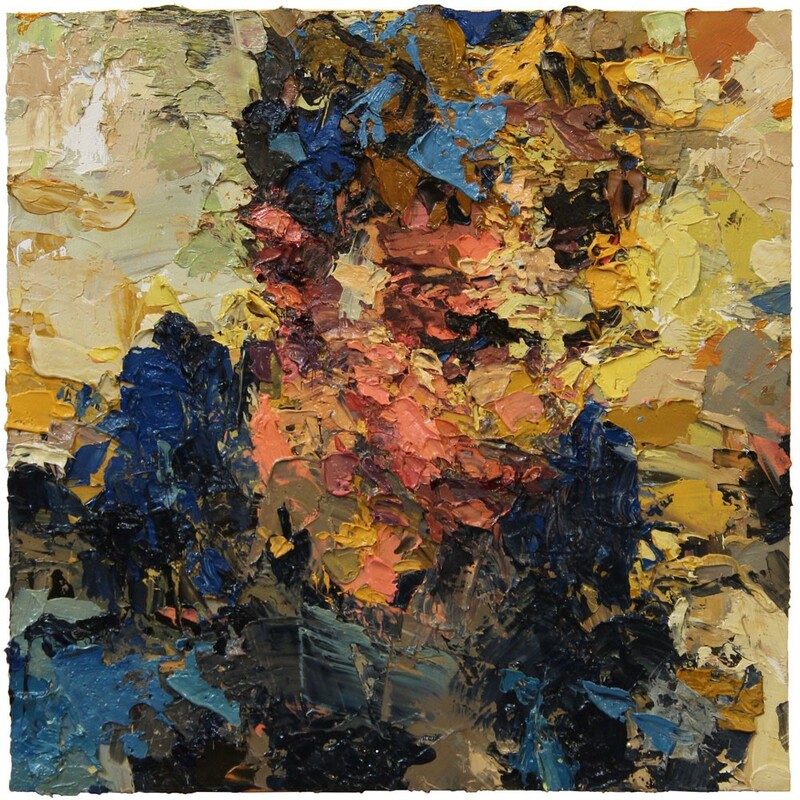 Image: Joshua Meyer (Painting Fellow ’10), BY THE BY (2018), oil on board, 10×10 in.